Tech Lighting’s Linger wall sconce illuminates upward with a single LED light shaped by an acrylic cylinder. Available in polished nickel and natural brass that will slowly patina for an exquisitely timeless look. 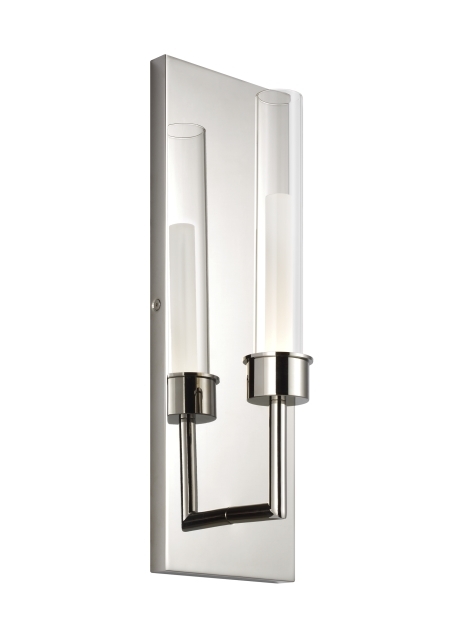 Also available as a two-light wall sconce, both options beautifully illuminate your bathroom, vanity and hallway. Complete your look with the Linger chandeliers. Lamping options are compatible with most dimmers. Refer to Dimming Chart for more information. Includes 120 volt 8.7 watt, 366 delivered lumens, 3000K LED module. Dimmable with most LED compatible ELV and TRIAC dimmers. 277V compatible with 0-10V dimmers. Mounts up or down. ADA compliant.